A work by a contemporary artist, rendered in characteristic Mughal style of Jahangir’s period when portraiture, that is, the true representation of some likeness, was a miniature’s core concern, this painting represents a Sufi saint in his traditional ensemble prescribed for his rank in the Sufi hierarchy. Akbar was the innovator of the painting style that the tradition designated as Mughal style. His father Humayun also patronised the art of painting but his court art pursued by and large the Persian idiom. Akbar not only had at his court a large atelier with about a hundred painters, most of them of Indian origin, but also completely Indianized its style. However, it was Jahangir who encouraged personal portraits and the portrayed figures also included divines, the Sufi saints in special. He not only got them painted but also often visited their Khankahs – seats or monasteries. Among Mughals, however, Dara Shikoh, the eldest son of Shahjahan, was the greatest admirers of Sufism and often spent his days with Sufi saints. He got many of them painted. 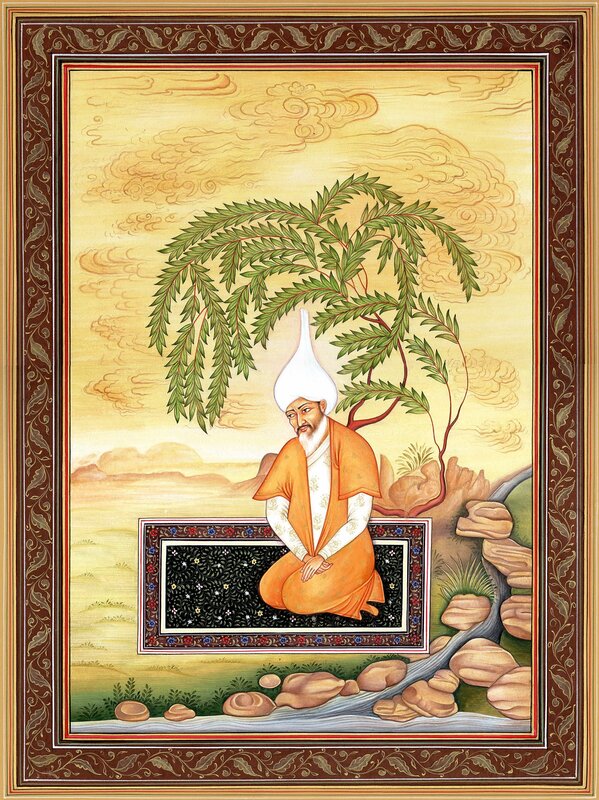 This painting depicts a Sufi Saint seated on a beautiful Persian carpet woven with intricate floral design laid under a willow tree close to a rivulet flowing in the midst of delightfully modeled rocks. Though there enshrines on his face a serene calmness and absolute contentment, in his eyes floats some concern, perhaps something related to some disciple’s problem. He has black moustaches with a long white bear. The ambience around is typically Persian – a pale yellow sky with clouds of a deeper tint hovering around. The actual painting is contained within a border consisting of a vine running all across. Its leaves have been so designed that they also look like queuing birds. He is seated with his legs turned back. He is wearing an off-white Jama woven with small floral design. Over it he is putting on his clerical vestment – a half-sleeve long orange choga with open front. His hands laid cross-wise rest on his lap, a demeanour reflecting thoughtfulness. He is putting on a white turban or cap styled like a marble dome with a finial-like towering apex. Along his vestment this headgear relates to his rank as a Sufi ascetic. As suggests the total set up of the painting, he has come to this serene silent spot away from the habitation for performing meditation. The rivulet is tinier but fast flowing and quite rhythmic in its pace. He is seated under a desert willow twisting over his figure like an umbrella. The styles of the rocks paving the rivulet are typical of Mughal Miniature Paintings. There reflects in the backdrop the weather’s dryness and traces of dusty winds. This description is by Miss Indra Vats. She has a deep interest in Indian art and iconography and is currently working at the National Museum of India, one of the premier organizations engaged in the curation and protection of Indian heritage.